Diversitech has 7 lathes. Three of the lathes have “Mill / Turn” capability. The Mill / Turn machines can turn a round part then put in side holes, top holes and other milled features all in the same machine with only one set up charge. Most of our lathes have bar feed systems. All of these features give us the ability to make your part with the minimum number of set ups and handling. 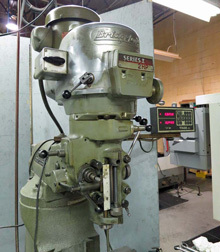 Diversitech has an assortment of “old school” milling machines, lathes and grinders. 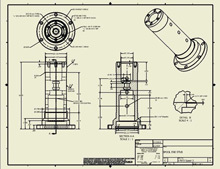 Even in the world of CNC machines manual equipment is sometimes quicker for finishing and secondary operations. 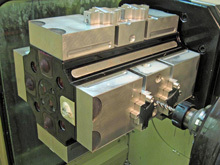 We regularly use this equipment to make in-house tooling and fixtures. Our manual machines also allow us to service our customers for small “one of” parts or emergency jobs. A significant part of the growth of Diversitech has been in contract assembly. We have both the experience and facilities to make mechanical, electro-mechanical and pneumatic assemblies to your specifications. 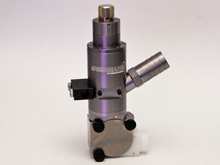 The assembly difficulty ranges from simple static assemblies to complex rotating machinery. 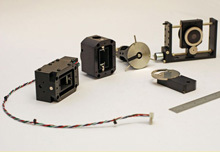 The assemblies use an assortment of component sources including internally produced, customer supplied and buy out items. When required we will test and certify the assembly as required and provide a certificate of compliance. A natural extension of our contract assembly services is kitting a sub assembly or finished product for an end user. The kits have included professional looking outside packaging, spare parts and instructions. We can also label and barcode the boxes per your requirements. Diversitech has small part welding and brazing capabilities on premises. We weld and braze parts to make custom assemblies to meet the customer needs. Engineering has been one of the services Diversitech has offered since the beginning. We can help your company with a new design or help you optimize an existing one. We employ the latest version of Autodesk Inventor 3D modeling software as well as the latest versions of AutoCAD for paperless collaboration with our customers. Autodesk Inventor can import and modify almost any modern 3D file so we can work seamlessly with customers on any CAD platform.